Allocate your time unevenly over the duration of one or more activities. Instead of spending the same number of hours on an activity each week, plan to spend more hours some weeks than others. 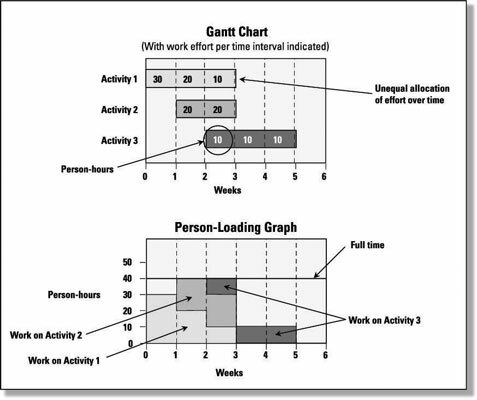 Suppose you choose to spend your hours unevenly over the duration of Activity 1 by increasing your commitment by 10 hours in the first week and reducing it by 10 hours in the third week, as depicted in the Gantt chart. The Person-Loading Graph illustrates how this uneven distribution removes your overcommitment in week 3. Take advantage of any slack time that may exist in your assigned activities. Slack time is the maximum time you can delay an activity without delaying the earliest date by which you can finish the complete project. Consider starting one or more activities earlier or later. For example, if Activity 3 has at least one week of slack time remaining after its currently planned end date, you can reduce your total work on the project in week 3 to 40 person-hours by delaying both the start and the end of Task 3 by one week. Assign some of the work you were planning to do in week 3 to someone else currently on your project, to a newly assigned team member, or to an external vendor or contractor. Reassigning 10 person-hours of your work in week 3 removes your overcommitment. 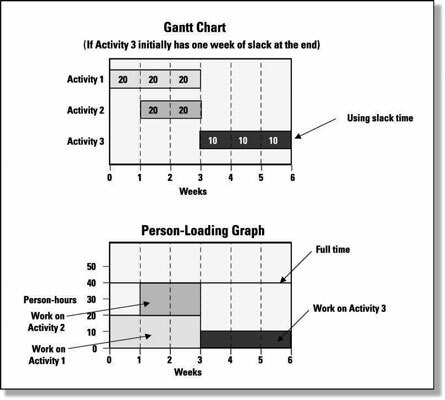 Show the total hours that each person will spend on your project in a Summary Person-Loading Chart. 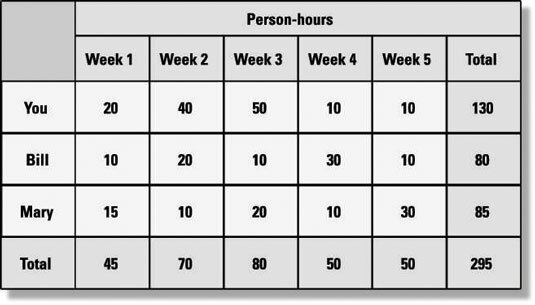 This chart allows you to identify who may be available to share the load of overcommitted people and to determine the personnel budget for your project by multiplying the number of hours people work on the project by their weighted labor rates.